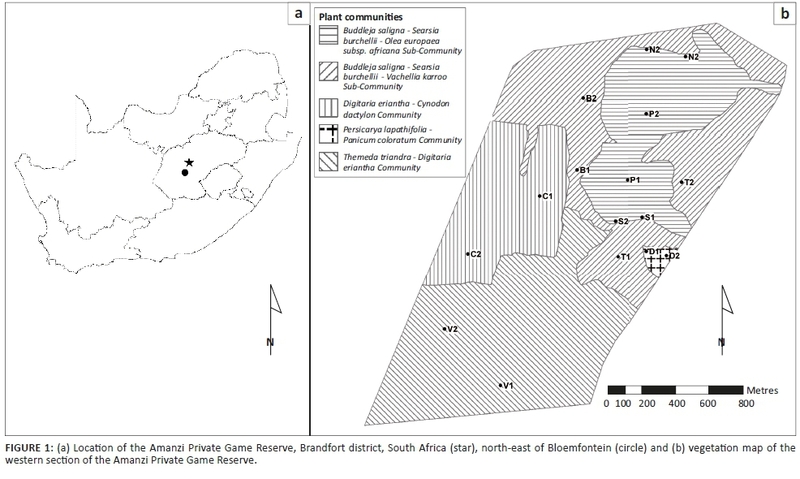 METHODS: Three of the sampled habitats were contrasting low-lying shrublands; three were contrasting hill aspects (northern slope, southern slope and plateau) in the Buddleja saligna-Searsia burchellii-Olea europaea africana subcommunity; one habitat was cultivated Digitaria eriantha pastures, and the last habitat was an area in and around a freshwater dam. Spiders were sampled by pitfall trapping in early spring (Sept. 2012), mid-summer (Jan. 2013), mid-autumn (Apr. 2013) and mid-winter (July 2013). In Africa, the Grassland Biome is largely limited to the central plateau of South Africa, Lesotho and parts of Swaziland (Mucina & Rutherford 2006). It is characterised by extremely high plant biodiversity, second only to that of the Fynbos Biome (Low & Rebelo 1996). Grasslands can be defined as a single-layered herbaceous plant community, with a few woody plants, which are usually restricted to specific habitats, including drainage lines and rocky hilltops (Carbutt et al. 2011). The Grassland Biome is one of the most transformed biomes in South Africa and is under continuous threat from cultivation, overgrazing and urban expansion (Bredenkamp & Van Rooyen 1996). Only an estimated 2.04% to 2.80% of this biome is formally conserved (Carbutt et al. 2011; O'Connor & Kuyler 2005), and therefore, effective management and conservation of private land is critical to protect its highly endemic fauna and flora (Wessels et al. 2003). Based on the results of the vegetation survey, spiders were collected in eight different habitats representing four plant communities (Table 1; Figure 1b). In the Buddelja saligna-Searsia burchelliicommunity, two different subcommunities were sampled, one of which included three habitats associated with the northern and southern slopes and plateau of a hill (Buddleja saligna-Searsia burchellii-Olea europaea africana subcommunity), and the second including two habitats, one dominated by Searsia burchellii and the other by Tarchonanthus camphoratus (Buddleja saligna-Searsia burchellii-Vachellia karroo subcommunity). The remaining three habitats sampled were the Themeda triandra-Digitaria eriantha community, which was dominated in the woody layer by Vachellia karroo; cultivated D. eriantha pastures (Digitaria eriantha-Cynodon dactylon community); and an area in and around a freshwater dam (Persicaria lapathifolia-Panicum coloratum community). The latter two communities had little or no plants contributing to the woody layer (Table 1). Two sites were sampled in each habitat, with at least 100 m separating them to avoid pseudoreplication. Five pitfall traps were placed 5 m apart in a straight line at each site. A soil auger was used for drilling holes, and plastic buckets 10 cm in diameter were used as pitfall traps. Ethylene glycol (100 mL) was added to each pitfall trap to preserve terrestrial arthropods for later identification. Collected material was removed and the pitfall traps refilled at the end of each month, from the start of September 2012 (early spring) to the end of August 2013 (end of winter). The sampled material was sorted in the laboratory and all arachnids were extracted from the samples and preserved in 70% ethanol. Following identification and tallying of adult spiders, material was deposited in the National Collection of Arachnida at the ARC-Plant Protection Research in Pretoria, South Africa. 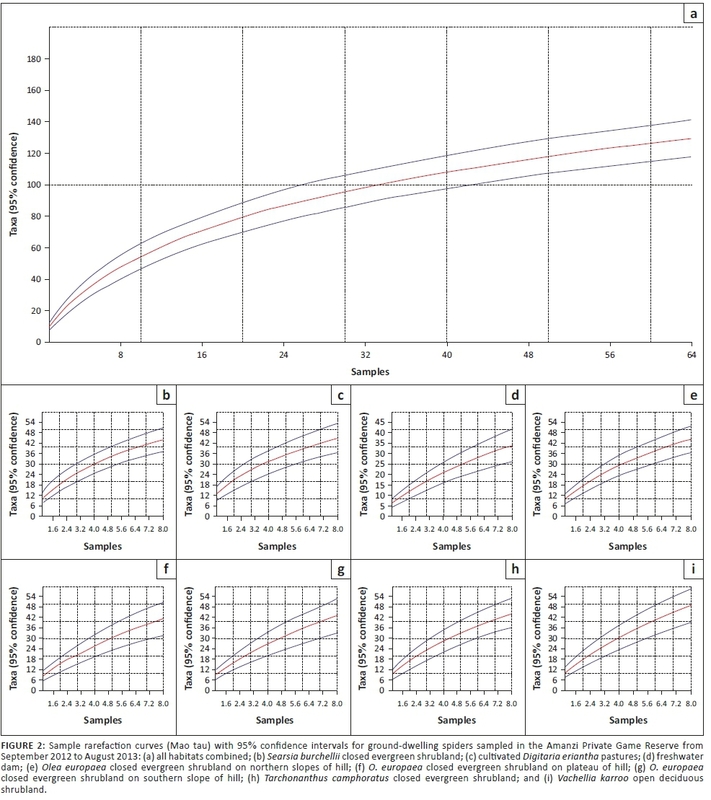 Inventory completeness was analysed in Paleontological Statistics (PAST) version 2.07 using the sample rarefaction function, which implements the 'Mao tau' analytical procedure, with standard errors indicated as 95% confidence intervals on the resulting graphs. We produced curves for each of the habitats, as well as the for the whole spider assemblage. 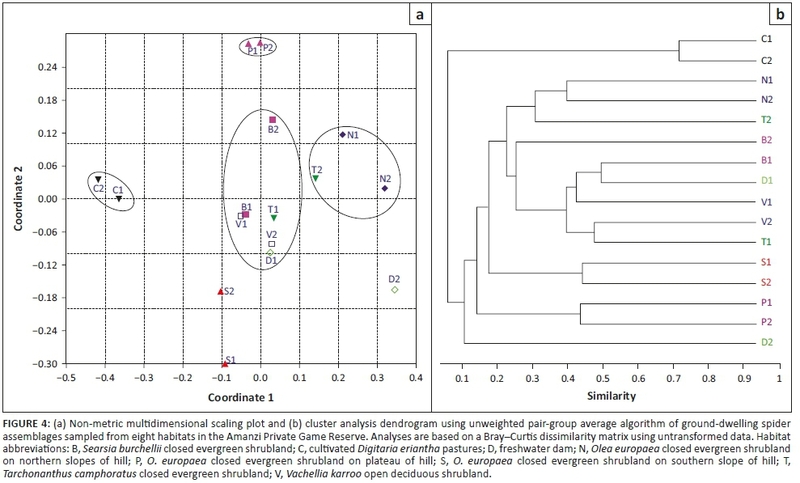 We then determined whether the two sites from each habitat sampled similar spider assemblages by performing a two-dimensional non-metric multidimensional scaling (NMDS), based on a Bray-Curtis similarity matrix. Ideally, the stress value of an NMDS should be lower than 0.2; otherwise, the resulting diagram needs to be interpreted with caution (Clarke 1993). Further, we performed a cluster analysis using the cluster function and unweighted pair-group average algorithm (Clarke & Warwick 2001). In both analyses, the pooled data from each of the 16 sampling sites were used. Further, a permutational multivariate analysis of variance (PERMANOVA) was performed to test for differences in assemblages between the eight habitats, using the Bray-Curtis distance measure and 10 000 permutations. These analyses were carried out in PAST version 2.07. Lastly, we attempted to identify indicator spider species, which are considered to be characteristic of a particular habitat. Indicator values were obtained by multiplying a species' relative abundance in a particular habitat, expressed as a percentage of its total abundance, with its relative frequency of occurrence in that particular habitat, that is, proportion of samples in which a species was collected (Dufrene & Legendre 1997). Thus, a species' specificity (narrow association with a particular habitat) and fidelity (frequency of occurrence in that habitat) is expressed as a percentage that can be compared with other species in the sampled habitats (Dufrene & Legendre 1997). A high indicator value illustrates a high affiliation of a species to a particular habitat, with a suitable benchmark of 70% being suggested (e.g. Haddad et al. 2010; McGeoch, Van Rensburg & Botes 2002; Van Rensburg et al. 1999). Gnaphosidae was the most species-rich family (32 spp., 24.81%), followed by Salticidae (17 spp., 13.18%), Lycosidae (15 spp., 11.63%) and Zodariidae (8 spp., 6.20%). Total species richness was quite similar between habitats, ranging between 34 and 48 species. However, Chao1-estimated species richness varied considerably, between 58 and 106 species per habitat, with the total ground-dwelling assemblage in the sampled habitats estimated at 167 species (Table 3). Although coverage values were above 0.85 for all the habitats, sample completion was much more variable (0.41-0.76), with 0.77 for the total assemblage (Table 3). This pattern was confirmed by the sample rarefaction curve for the whole spider assemblage (Figure 2a), which approached an asymptote but did not level out, indicating that the majority of the ground-dwelling species in the sampled habitats had been collected. However, none of the habitats' rarefaction curves approached an asymptote (Figures 2b-i), indicating that a considerable portion of the fauna of each was still unsampled. Because open grasslands were not sampled in this study, it could be expected that the total species richness at APGR may further exceed this projected value of 167 species. Nearly half of all the spiders (n = 1480, 49.63%) were collected from the two cultivated D. erianthapasture sites; indeed, spider numbers in this habitat were exactly five times higher than the habitat with the second highest activity densities, Searsia burchellii closed evergreen shrubland (n = 296). However, linear multivariate regression showed no significant differences between habitats in log-transformed spider activity densities (F2,61 = 1.125, p = 0.3313) or species richness (F2,61 = 0.3105, p= 0.7343). The assemblages of cultivated D. eriantha pastures were very unique, largely because of the absence of woody plants. Although studies in open grasslands in South Africa have shown very contrasting patterns of family dominance (Haddad et al. 2015; Jansen et al. 2013; Lotz et al. 1991; Van den Berg & Dippenaar-Schoeman 1991), the dominance of Ammoxenidae in the cultivated D. eriantha pastures studied here is quite extreme (66.15%). This could be attributed to the high abundance of Hodotermes mossambicus (Hagen, 1853) termites in the pastures, which are the sole prey of A. amphalodes(Petráková et al. 2015). Similarly, the high activity of Ranops sp. in this habitat (13.24%) can be attributed to high activity densities of their mimetic model and possible prey ant, Anoplolepis custodiens(F. Smith, 1858) (Haddad 2012). Interestingly, these were the only two spider species with indicator values above 70.0%, suggesting that the other species sampled had more general habitat preferences, were more strongly seasonal in occurrence or were too scarce to serve as meaningful indicators of particular habitats. The ten species of mygalomorph trapdoor spiders collected in four months' sampling (~9600 pitfall trap-days) is quite remarkable. 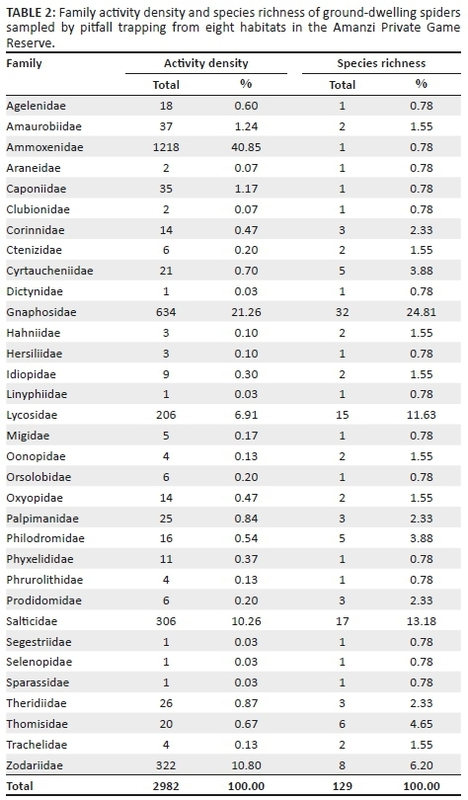 This is higher than the eight species collected during nearly 22 000 pitfall trap-days' sampling in open grasslands in the Erfenis Dam Nature Reserve (Haddad et al. 2015) and the five species collected in open grassland during 36 500 trap-days' sampling in the Free State National Botanical Gardens (J.A. Neethling & C.R. Haddad [University of the Free State] unpubl., August 2010 to May 2011), both within a radius of 70 km from Amanzi. This is probably because of the more structurally and topographically variable habitats sampled in the current study compared to open grasslands sampled in the latter two studies. The inclusion of open grassland habitats in the current study would likely have increased the trapdoor spider diversity at this site. For example, Calommata meridionalis Fourie, Haddad and Jocqué, 2011 (Atypidae) was not collected in this study but has been recorded from the other two sites (Fourie et al. 2011; Haddad et al. 2015). In addition, an unidentified Harpactira sp. (Theraphosidae) has also been collected from burrows and/or at night at all three localities, but has yet to be sampled using pitfall trapping. Kobie Fourie is thanked for permission to conduct this study at Amanzi Private Game Reserve and for providing accommodation during the field work to the second author. Ansie Dippenaar-Schoeman (ARC - Plant Protection Research Institute, Pretoria) and Leon Lotz (National Museum, Bloemfontein) are thanked for identifications of some of the species. The Free State Department of Economic Development, Tourism and Environmental Affairs is thanked for collecting permits that made the study possible.